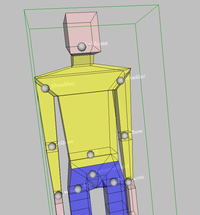 This component defines nodes for humanoid animation. See also X3D specification of the H-Anim component. We support the H-Anim component, so you can render your humanoid and animate it through interpolators. Both skeletal and skinned animation is supported. As you see, X3D version has exactly the same nodes, working the same way, but with HAnim prefix before node name. (I have no idea why this prefix was added in X3D specification, but it's supported.) Actually we allow both versions (with HAnim prefix and without) in all VRML and X3D versions (with our engine you can generally mix VRML/X3D versions). But VRML authors/generators should not overuse this, and try to conform to appropriate spec where possible. The implementation takes some care to handle all existing H-Anim versions: HAnim 1.0, HAnim 1.1, HAnim 200x. skeletal — you place your geometry inside joints (as segments or sites). This is simple, and joints work then quite like animated transform nodes. Animating transformations of Joint nodes and such is optimized, just like for Transform node. 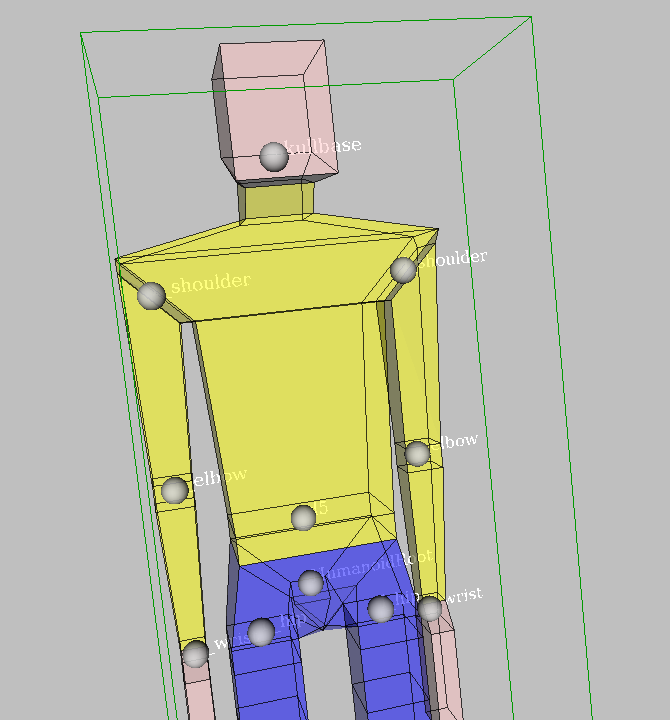 skinned — place the actual geometry (shapes) inside "HAnimHumanoid.skin" field. Then you refer (USE) the skin coordinates in "HAnimHumanoid.skinCoord". And finally, in each joint you modify skin coordinates by "HAnimJoint.skinCoordIndex", "HAnimJoint.skinCoordWeight". Remember that you also have to list (USE) all the joints inside flat list "HAnimHumanoid.joints". Actually, specification requires them in every case (not only for skinned animation), but our engine for now uses them only for joints that affect "skinCoordIndex". InstantReality has a nice overview of how the X3D nodes should be set up, see also the X3D and latest H-Anim specifications of course. You can try the view3dscene Edit -> Add Humanoids Joints Visualization menu option to see the joints centers and their names. TODO: skinNormal is not supported yet.